As the Judge Dredd & The Worlds of 2000 AD Kickstarter enters its final days, we have got approval from Rebellion to share some really exciting news, and we wanted to tell you as soon as possible! 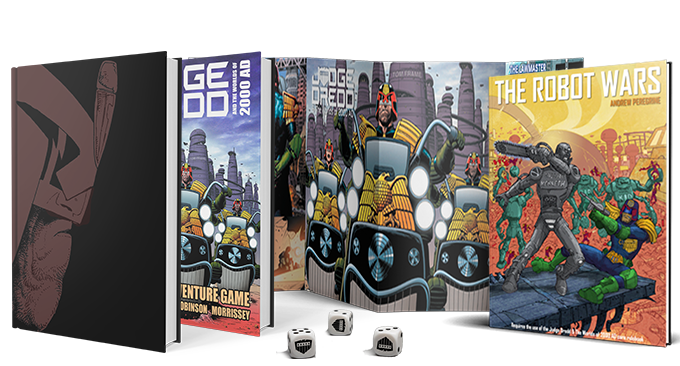 We have a range of products planned for 2019, all of which will require theJudge Dredd & The Worlds of 2000 AD core rulebook. Today we'd like to tell you about four of them. We do need to make it clear that these four books are not stretch goals in this Kickstarter -- they are planned releases for 2019. However, to use them you will require the core rulebook offered in this Kickstarter. At this stage, we can't share release dates. We also need to clarify that the covers below are not necessarily the final covers, and may change before release. As you know we intend to work out way through Judge Dredd's chronology. We begin in 2099 with The Robot Wars (which is part of this Kickstarter). The next two story arcs are Luna-1 and The Cursed Earth. Luna-1, a city on the moon ruled by a triumvirate of uneasy powers. Here, people come to start a new life or escape their old one, but even the moon isn’t free of the reach of the Judges. The law knows no bounds! Join Dredd as he takes on the Luna, Sov-Judges, politics, and the scum who’ve left Earth behind. Patrol Lunar City One, and learn about the Luna Judges, STUP-Guns, and Zipper Bikes. With information on the Space Corps, along with the rest of the solar system, including Titan Penal Colony, this supplement expands your Judge Dredd & The Worlds of 2000 AD game into space! A full city guide to Luna-1 and it’s political intricacies, espionage and betrayals. The rest of the solar system bound between the pages of a book, from Luna to Titan and beyond, the reach of the law is never-ending. New equipment, characters, and profiles of Judges from other nations—or what remains of them. In the future, even space is no escape from Judge Dredd! Outside the walls of the teeming metropolis known as as Mega-City One lays a vast, radioactive wasteland of lawlessness and lunacy knows as the Cursed Earth. Muties, dinosaurs and mad generals make their home out here...and other things to make even the toughest Judge flinch. Are you foolish or brave enough to walk the Cursed Earth? 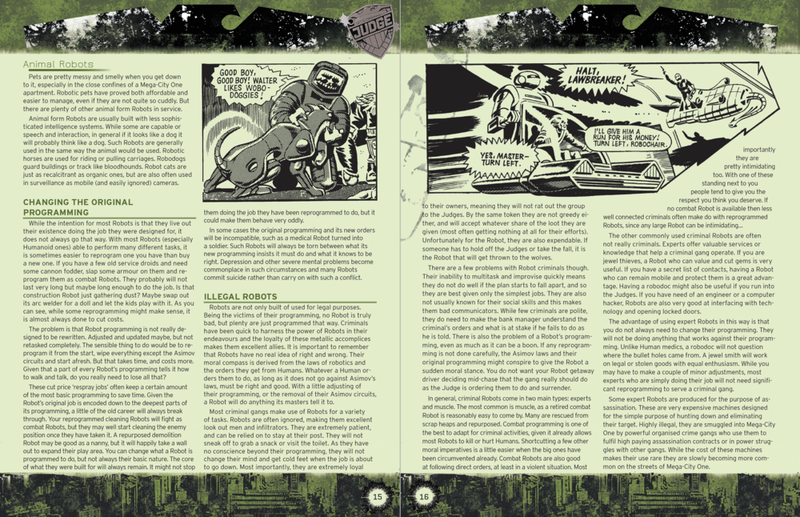 A full guide to the places and people that populate the blasted world left by the Atomic War. Dozens of NPCs ready to challenge you players with might trickery, and sheer weirdness. A detailed look at the Long Walk—a Judge’s final patrol. Expanded rules for Mutants and mutations, along with new careers for those who live in the wastelands. More critters and varmints than you can shake a Lawgiver at. 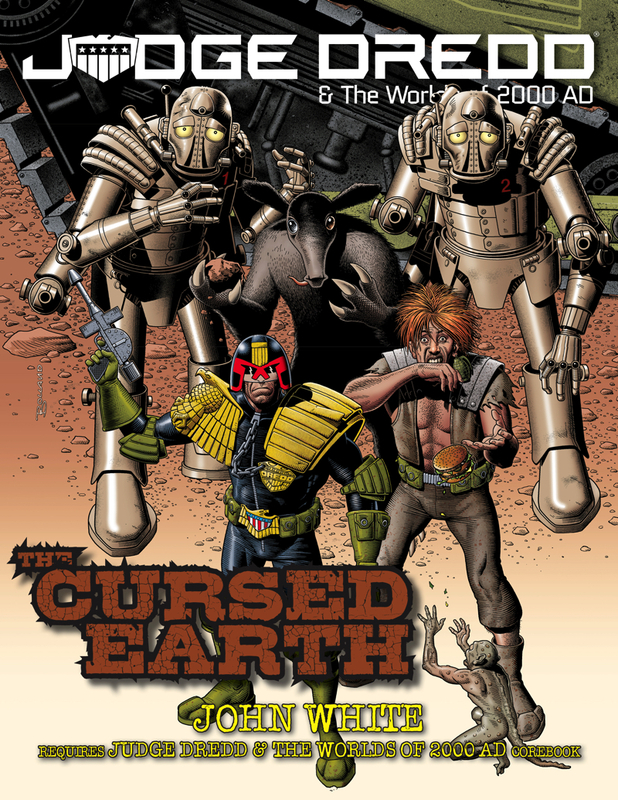 We are really excited to announce the first of many of our "Worlds of 2000 AD" sourcebooks. 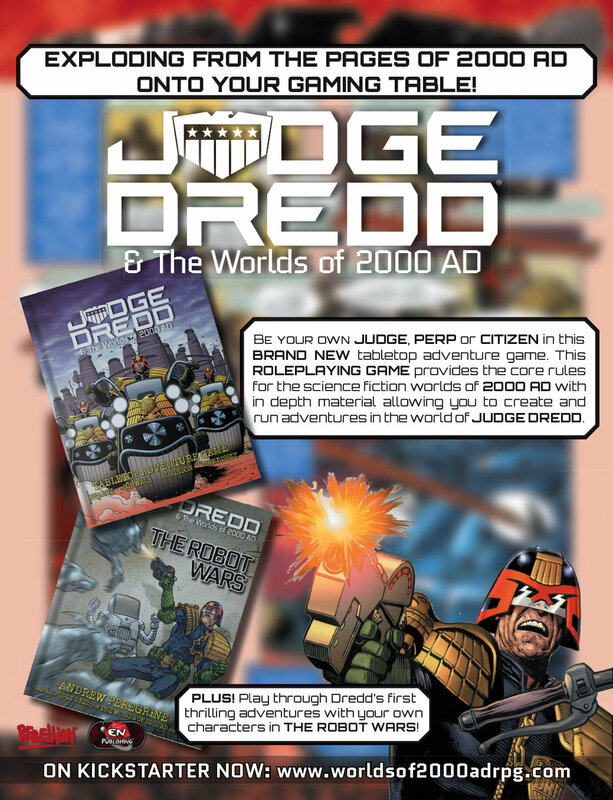 These setting books do not repeat the core rules found in the Judge Dredd & The Worlds of 2000 AD hardcover; they detail other 2000 AD settings, including all the careers, equipment, new rules, races, and more that you'll need. Nu-Earth, one battlezone among many that proves mankind brought its penchant for war to the stars. On a planet devastated by biochemical weapons, the very atmosphere itself kills. The Norties and the Southers gear up in protective suits, hurling themselves into an eternal war over a ruined world, determined to kill each other to the last man… but the last man standing may not be a man at all. Instead he might be the last surviving member of the Genetic Infantry—Rogue Trooper. 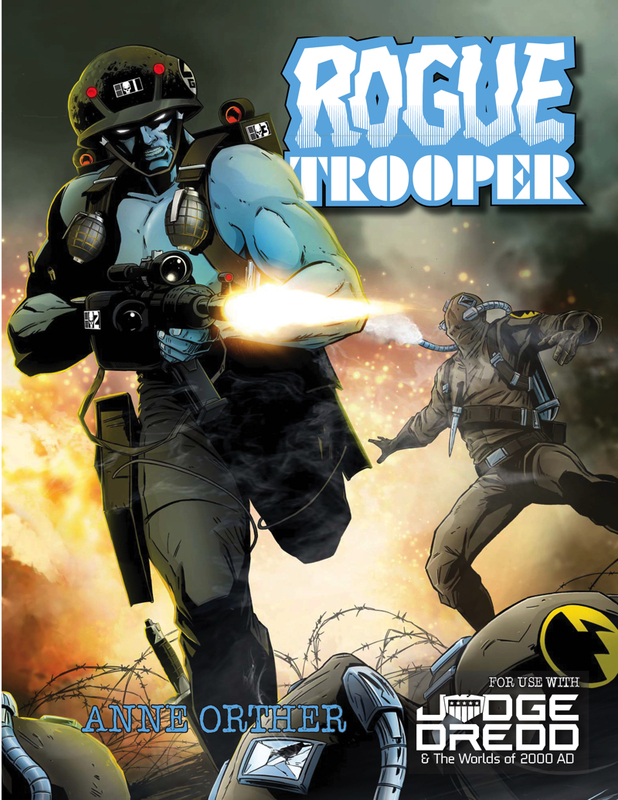 Genetically engineered to be impervervious to the hellish chemicals on Nu-Earth, Rogue Trooper scouts the insane territories of a ruined world, seeking vengeance for his fellow GIs, wiped out in a massacre arranged by a member of his own side. He doesn’t just seek vengeance for himself, but for three of his dead friends, their personalities wired into his weapons and equipment. The classic 2000 A.D. stories of war and human folly comes to RPGs at last. Join the Gentic Infantry.. Kill for a cause, even if that cause is only ensuring that your friend’s deaths count for something. Full rules for creating and playing Genetic Infantry as well as Norts, and Southers, the two sides of the eternal war of Nu-earth. A host of personalities to meet and fight with or against, from the sinister scrap dealers who scour battlefields taking whatever they please, to the power mad generals who their men as pawns. More carnage than a single planet can contain! Most mutants poisoned by Strontium 90 are horribly disfigured, possessing no special abilities. Some few, however, have powers to accompany their strange appearance. One such mutant is Johnny Alpha. Resistance hero, warrior and champion of the forgotten and downtrodden...not to forget inescapable pursuer of justice. Join Alpha, or build your own crew to hunt the worst criminals across space and other dimensions. It’s a dirty job, and society’s decided a mutant has to do it. Life isn’t fair. You got the wrong end of the stick. Your only way up is to run down the worst of humanity. Join the S/D and see the galaxy. If your lucky you might even make some money before your head is blown off by a variable-cartridge blaster! Rules for mutations and disfigurations. 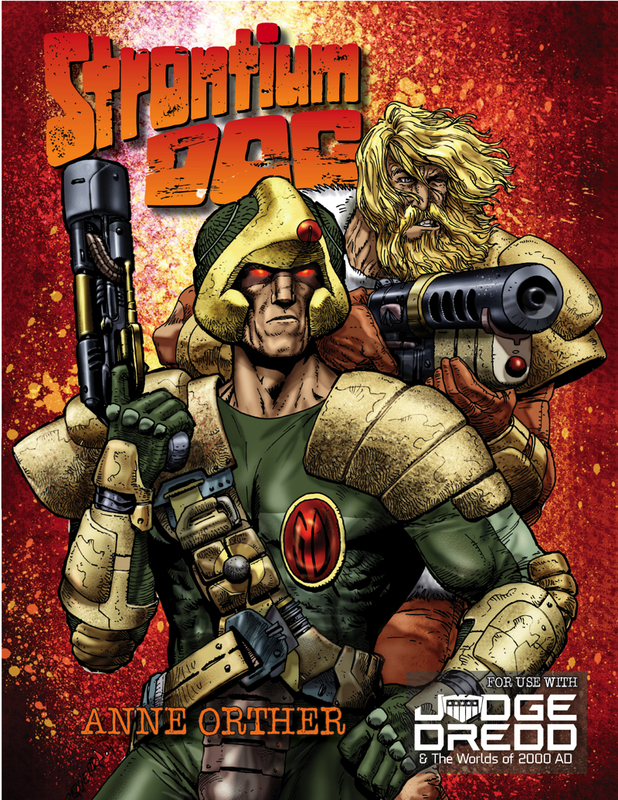 Not every mutant gets powers like Johnny Alpha, but that doesn’t preclude them from being a Strontium Dog. A surreal setting: part space opera, part spaghetti western - at once comedic and tragic. Rules on manipulating, or being manipulated by, time and different dimensions. The Galaxy’s Most Wanted—an index of the perps, killers, robbers, and war criminals your kind must hunt down. Travel through space-and time to get your quarry: dead or alive! 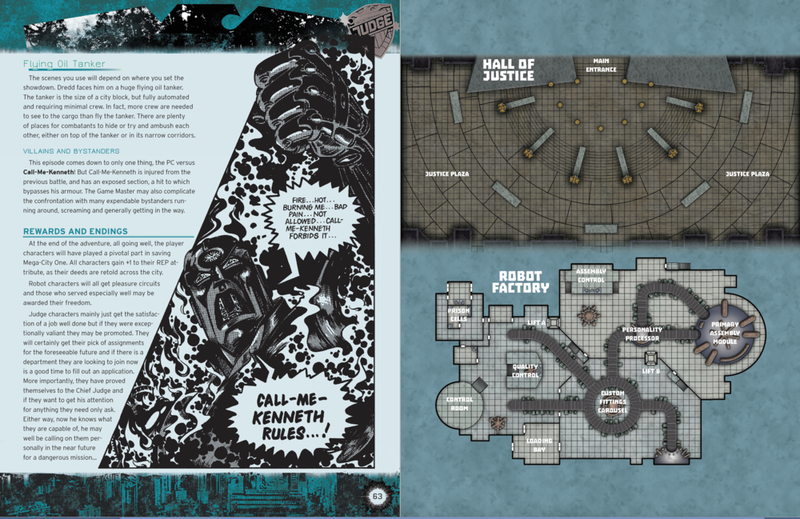 The Fandomentals website has published an article about the Judge Dredd & The Worlds of 2000 AD tabletop RPG, talking about the game and the Kickstarter. Geek entertainment megasite Geek & Sundry has featured the game in an awesome article/preview! Morrus Appears On Shane Plays! 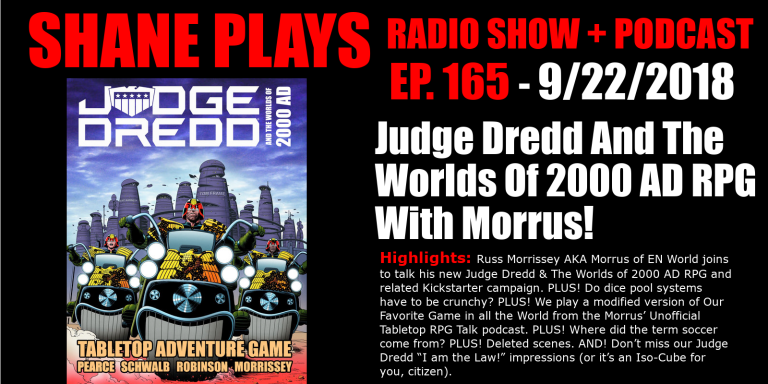 Russ Morrissey AKA Morrus of EN World joins the Shane Plays show to talk the new Judge Dredd & The Worlds of 2000 AD RPG and related Kickstarter campaign. PLUS! Do dice pool systems have to be crunchy? PLUS! 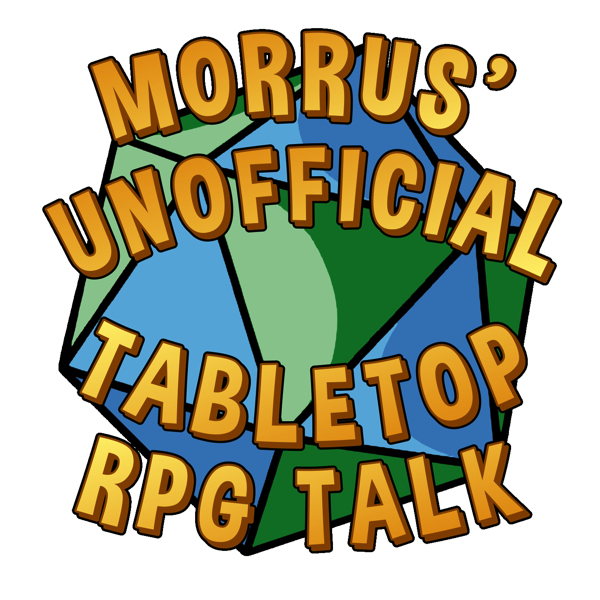 We play a modified version of Our Favorite Game in all the World from the Morrus’ Unofficial Tabletop RPG Talk podcast. PLUS! Where did the term soccer come from? PLUS! Deleted scenes. AND! 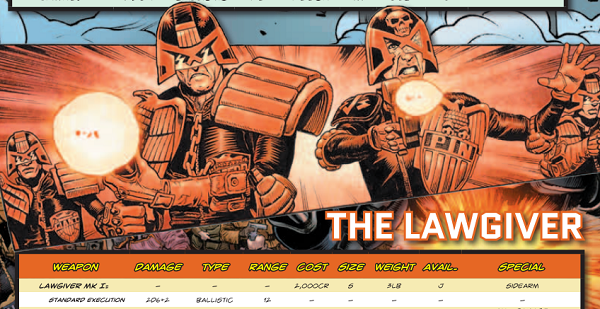 Don’t miss our Judge Dredd “I am the Law!” impressions (or it’s an Iso-Cube for you, citizen). Russ Morrissey (Morrus) appeared in a livestreamed interview over at Victory Condition Gaming! Also, the VCG guys will be doing an actual play of Judge Dredd and the Worlds of 2000 AD on Sunday, Sept 30th at 2:00PM EDT on the show - be sure to tune in at this link! Attention thrill-seekers! Russ Morrissey, designer of the W.O.I.N system joins the lads on the awesome "What Would The Smart Party Do?" podcast to talk about this new take on Judge Dredd and the Worlds of 2000AD. A nostalgiac trip to the early days of gaming, inside scoops and future products, a view of the system, chat about how to make a successful Kickstarter and more await you! Head straight on over here to hear the podcast! But that's not all! 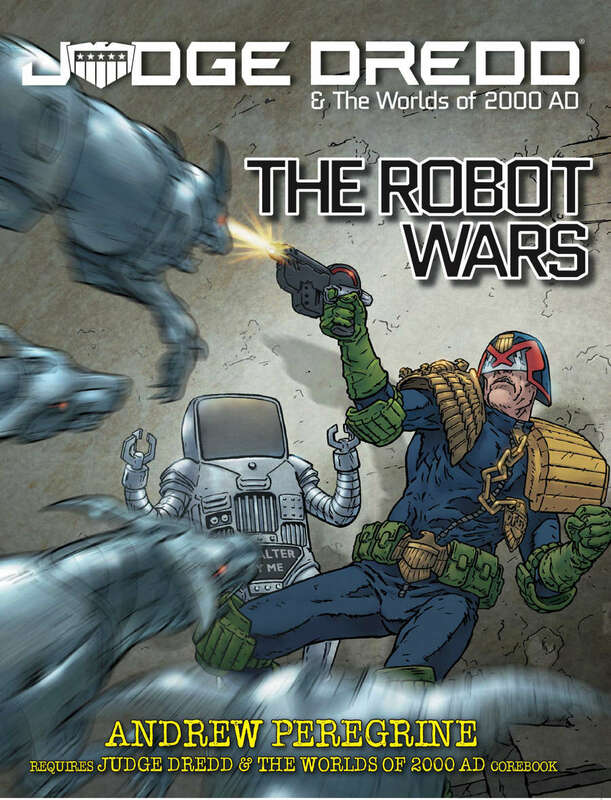 Dawn of Comics takes another look at The Robot Wars right here! An Exclusive Preview Over At Bell Of Lost Souls! Our friends over at Bell of Lost Souls have an exclusive preview of Judge Dredd & The Worlds of 2000 AD! "I am now more on board with this game than any other game I’ve ever seen in my life. I just want to play a Gorilla and jump into combat and throw foes against a wall." Check Out These Exclusive Previews! 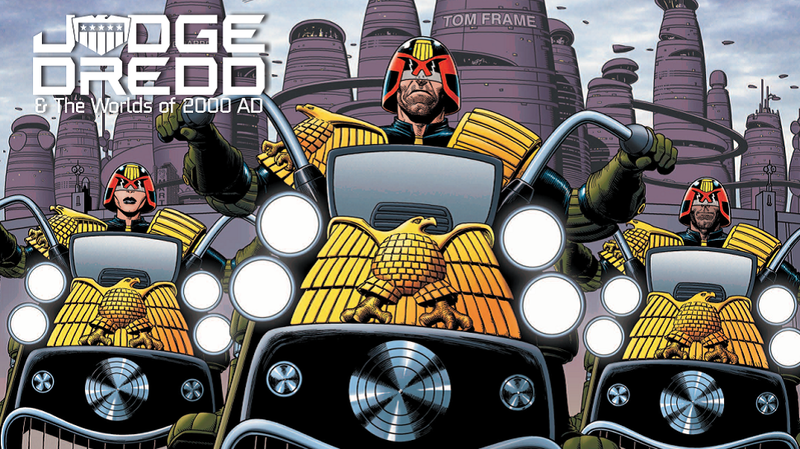 There's an exclusive preview of Judge Dredd & The Worlds of 2000 AD over on Vampifan's WOIN Blog! 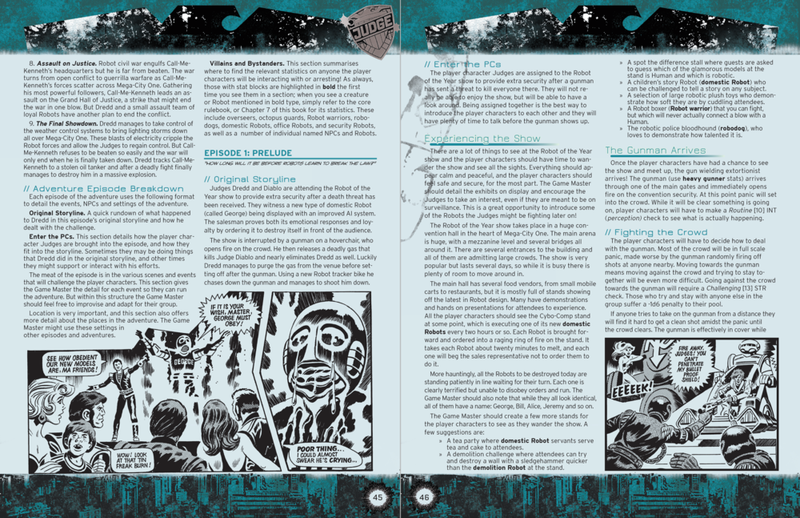 See the contents page, a Street Judge, mutations, and more! Explore Mega-City One and beyond with the official tabletop roleplaying game for the galaxy's greatest comic! The Judge Dredd & The Worlds of 2000 AD Kickstarter launches on Tuesday September 25th at 5pm GMT! (That's 10am PT, 12pm CT, 1pm ET) "Judge. Jury. Executioner. 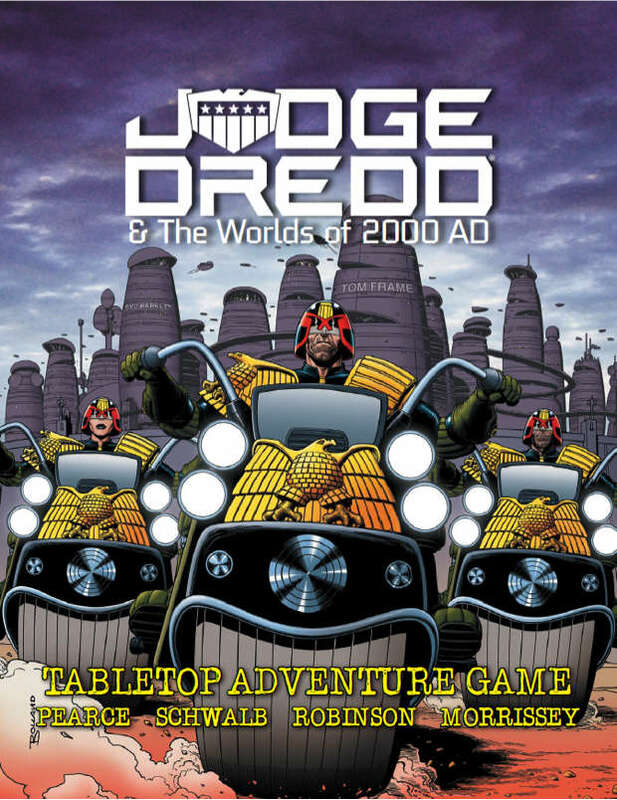 Play as a Judge of Mega-City One and bust perps, Sov spies, and mutant raiders in this action-packed standalone tabletop roleplaying game, bringing to life the iconic characters and worlds found in the legendary British comic 2000 AD. This book is your introduction to Mega-City One, and your gateway to a line of supplements based on 2000 AD's many characters and settings." The Robot Wars, 150-pages, the first in a series of softcover sourcebooks and adventures! Special limited edition Judge Dredd dice set! 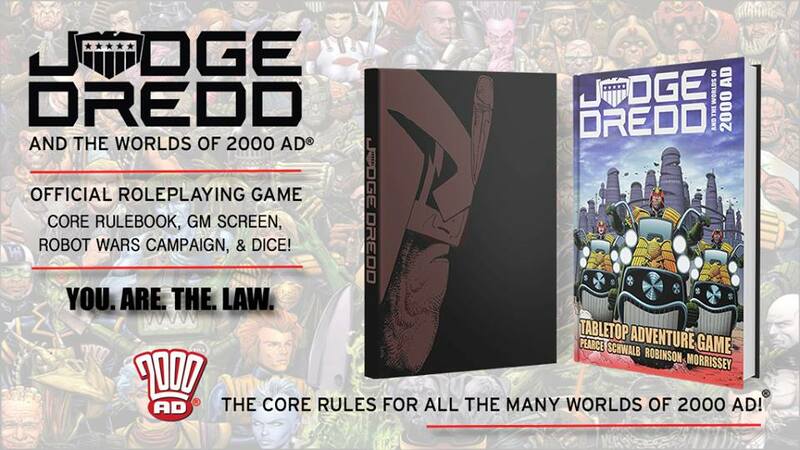 We can officially confirm that Judge Dredd & The Worlds of 2000 AD will be coming to Kickstarter in just a few weeks. We'll announce the exact date very soon.